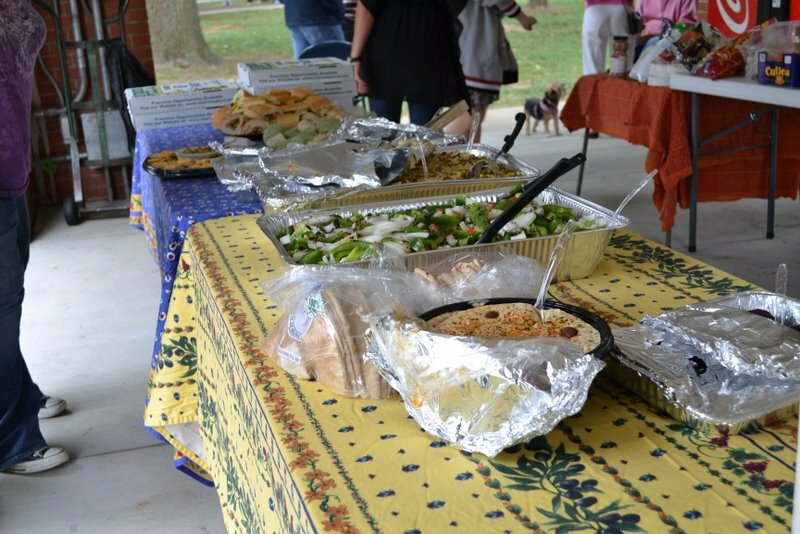 This past Sunday Student Career Alternatives Program(SCAP), a project of AFSC, hosted an event called "Food For Thought". 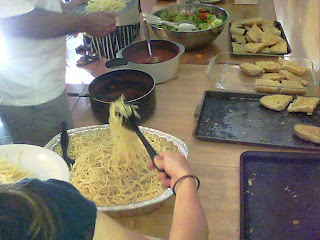 SCAP organizers spent all day cooking a delicious three course meal for attendees. 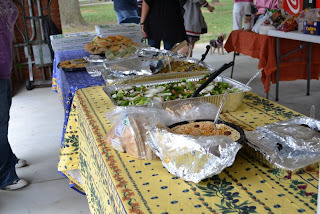 The event was a fundraiser for SCAP's scholarship fund, and it was an opportunity to create important conversations about some of the issues SCAP focuses on. After everyone loaded up on food we screened two short films, the first one was, "Last Best Option" which was produced by several really talented Georgia State Students. The film basically chronicled some of the work the SCAP does in Atlanta. 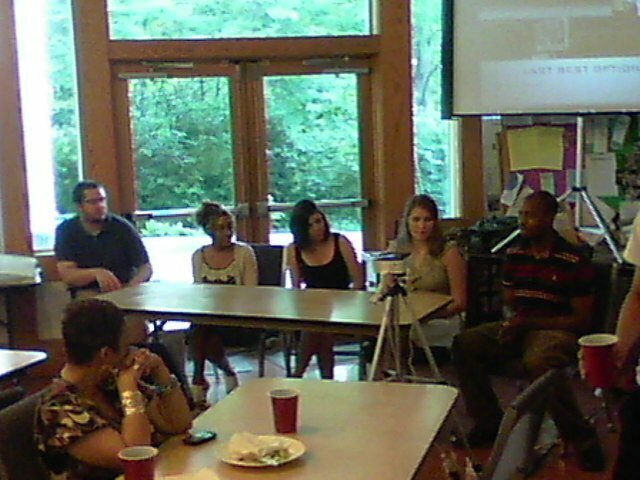 We were really lucky to have all the film makers( Kristy Breneman, Kristen Woolford, Victoria Temple, and T.J. Hicks) present along with one of the youth featured in the film(Aisha Davis) for a Q&A after the screening. We all feel that, "Last Best Option" is a really great snap shot into what SCAP stands for, and more importantly what we actually do. Sometimes it's difficult to adequately give the skinny on how SCAP works, so it's really amazing to have this resource to share with folks in the future. The second short film entitled, "Migrant Youth Voices" is on in a series of films designed to raise the voices of undocumented youth in Georgia. The short that was shown Sunday evening was a compilation of several interviews. 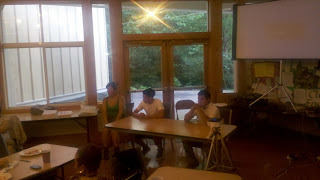 The audience was treated to a Q&A with both of the courageous youth chronicled in the film. I can honestly say that there were few dry eyes after the short film was shown. I can't explain how truly inspiring it's been working everyone associated. Migrant Youth Voices is part of a national AFSC effort, here in Atlanta we've been watching what Oakland's been putting out with excitement. We're really excited at the prospect of showing both of these films around the state or Georgia, feel free to contact me in you would like to set up a film screening at your school, church, community center, ect. Big thanks to everyone that came out Sunday! 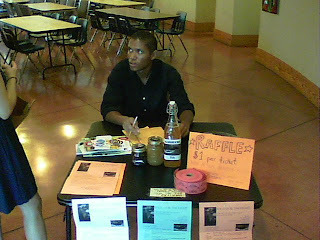 We raised a lot of awareness and over $4oo.oo for SCAP's scholarship fund! to obtain highly sensitive government secrets. The press conference articulated the ridiculousness of these accusations. 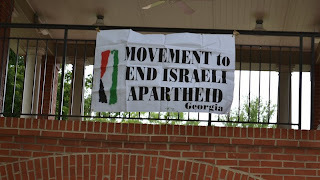 The reality is that PSA has been working, very publicly, with the Movement to End Israeli Apartheid Georgia(MEIAG) on a campaign to end the Georgia International Law Enforcement Exchange. The exchange basically brings Israeli police to Atlanta to learn drug enforcement tactics while Georgia law enforcement official go to Israel to learn counter insurgency methods, often times in occupied Palestine. PSA had simply filed an open records request in an effort to find out more about the program, which is housed on the GSU campus, and it's impact on the community. 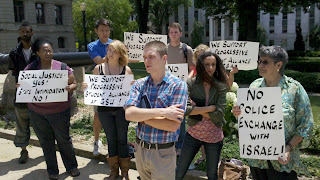 The press conference was held outside of Attorney General Sam Olens office, as he was featured in the story and tossed out some of the more bizarre accusations like claiming PSA’s actions were motivated by the influence of an external organization that may seek a “terrorist attack on local law enforcement.”Or insinuated that GSU students were incapable of developing their own political analysis. PSA and their community partners have been running a very public campaign, and this is extremely knowable information. All channel 2 or Attorney General Olens would need to do to learn all there is about the campaign to end the GILEE program is do a google search. So either they didn't take the time to do a simply google search, or they left out knowable information in favor of running a story with sensational sinister implications. It should be noted that Cox Entertainment owns Channel 2, and they're a major contributor to the GILEE program. One great paradox is that the actual shady organization here isn't PSA or MEIAG, it's GILEE and GILEE's connection to Cox Entertainment and the Attorney General. Let us not forget who these folks are supposed to be serving. Students have the right to ask questions about a program that connects their campus to an apartheid state, to file open records requests, and to do so without being called puppets or terrorists. 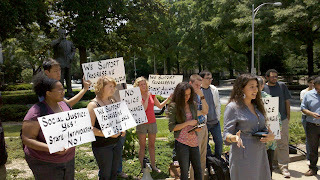 See video footage of the press conference shot by Atlanta Indy Media. 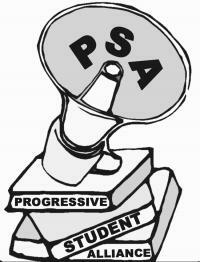 The Progressive Student Alliance (PSA) of Georgia State University is deeply troubled by the allegations made on WSBTV on May 24, 2011 regarding a open records request made by the PSA. The request concerns GILEE, the Georgia International Law Enforcement Exchange program, housed at Georgia State University, which is a police exchange program between Georgia police officers and the Israeli police. In WSBTV’s coverage of the request, Attorney General Sam Olens stated that the PSA’s actions were motivated by the influence of an external organization that may seek a “terrorist attack on local law enforcement.” Not only are these comments completely false, misleading, and malicious, but Olens goes on to patronize students, insisting that “students don't wake up one morning and say I wonder where the Dunwoody police officers are receiving training in Israel on terrorism.” Olens argues that students would never have an interest in complex political and social issues and that “somebody bigger” is behind asking for a Freedom of Information Act request. 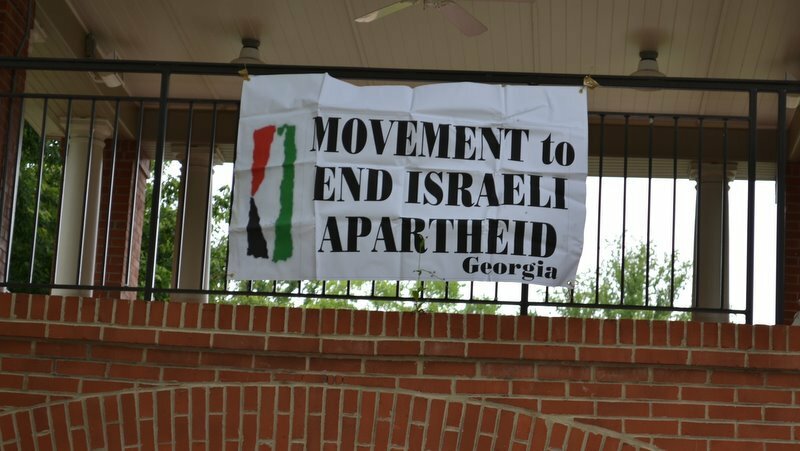 Olens' disbelief in a student organization researching and combating questionable ties between Georgia State University and a country with numerous human rights violations shows a complete disregard for the importance of intellectual inquiry, debate, and social justice. There will also be a press conference tomorrow(5/27) 1:30pm in front of attorny General Olens office. Where Is The Love Georgia? 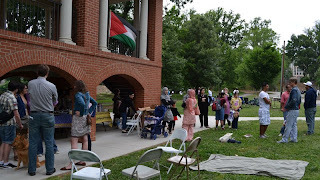 The American Friends Service Committee was one of several organizations that co-sponsored the “Love Your Neighbor Rally” located in Gainesville, GA, an event where several families, community leaders, and allies gathered to voice their opposition to HB 87, recently signed into law by Governor Deal. Maria Duarte from the Georgia Association of Latino Elected Officials (GALEO) announced that HB 87 goes into effect July 1 and promised the crowd that the legislation will fail. Maria stated there were 8 million people eligible to become citizens; she requested these people gain citizenship and for all citizens to register to vote. Maria stressed that it was important not to be guided by myths and rumors, and to “focus on the resources we have and not on what we don’t have.” An immigration lawyer based in Gainesville denounced HB 87, stating it was immoral and unconstitutional, and informed the crowd of their rights (including the right to remain silent). He then assured them that the majority of HB 87 will be blocked. 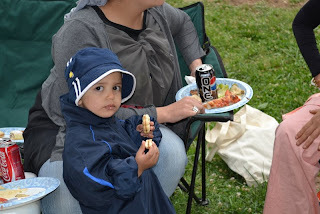 The rally had a mostly day festival feeling with prayer and songs, face painting, water and sandwiches for folks who wanted them, Mexican ice cream, and a clown making balloons for the children. The crowd that day was little over 300 people; there were tables set up for people to register to vote and plenty of shade where most folks were able to stay cool. The Gainesville rally was occurring at the same time as a local auto show, but aside from getting to see some swanky cars driving down the street, the other event did not prevent several hundred people from attending the rally. SCAP has had the privilege of developing relationships with many high schools through out it's years. One of those schools is Cross Keys High School. This year Cross Keys approached SCAP with the opportunity to honor a student that we felt really represented the values of SCAP. We were invited to the Cross Keys Seniors Honors night. Excited at the opportunity, SCAP members put together two scholarship awards and the requirements for both awards. One award was the SCAP Social Justice Scholarship, that was to be awarded to a student who has demonstrated a commitment to social justice in the community. 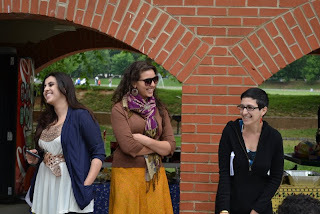 Our second scholarship we titled the SCAP Art of Activism Scholarship. This scholarship was to go to a student that used art to articulate the systems of violence and oppression that control our bodies, minds, and communities. 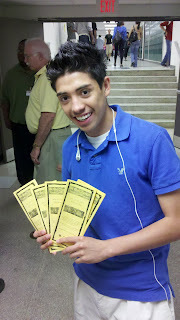 With the help of Cross Keys Staff we were able to recognize two very worthy students each with a scholarship of $200! 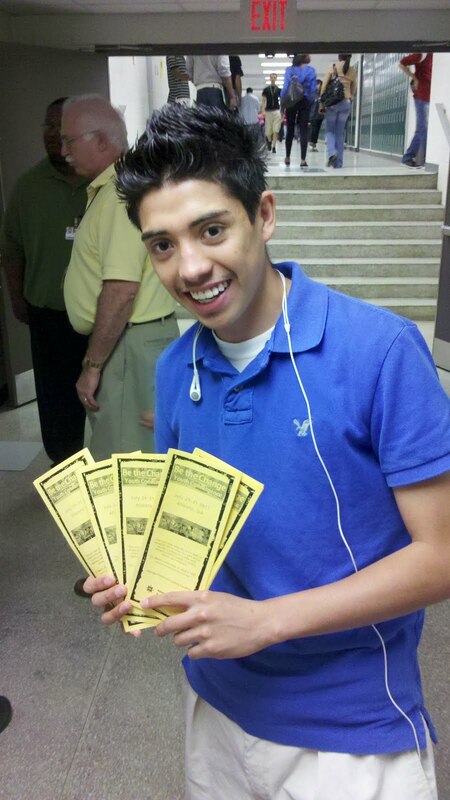 Javier Garcia won the Social Justice Scholarship and has been greatly involved with Migrant Youth Voice, a project of American Friends Service Committee and SCAP. Javier has inspired many people with his personal story and has encouraged his peers to also share their stories and raise their voices. The winner of our SCAP Art of Activism Scholarship was Kayla Thomas. Kayla wrote a beautiful poem expressing how a young girl dealt with violence and oppression in her community and how courageous she was to give minorities the stage. As SCAP members sat through the formal Awards Ceremony for Cross Keys, we learned just how dedicated the two winners of our Scholarship were. As they continued to be recognized for their high school accomplishments we felt secure that our SCAP scholarship would be helpful for them to further accomplish their goals! 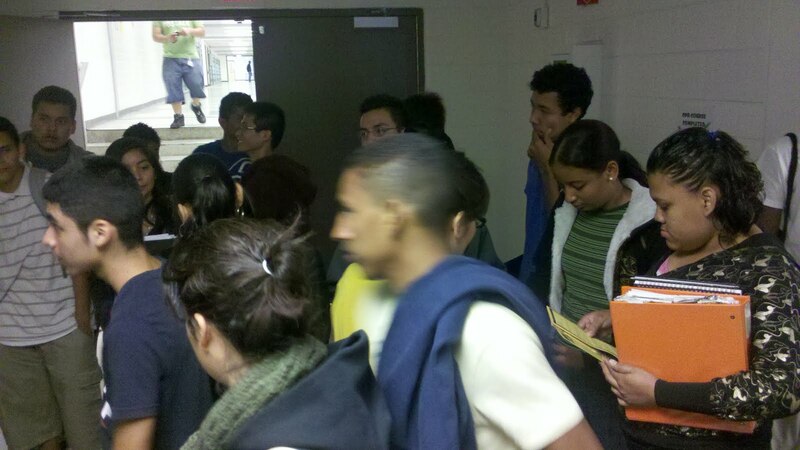 Parents wore prideful tears, and the students expressed amazing gratitude towards SCAP. These honorary new SCAP members let us know that we'll definitely be seeing more of them in the future! It was a major thing for SCAP to be able to help the students who have worked so hard to help our efforts and their communities. SCAP is looking forward to continuing the legacy of the SCAP scholarship awards! However, funding is not always there. So we will be hosting benefits for our SCAP Scholarship award. One in the near future is a benefit dinner on May 29th at 6:30pm. You can find the details HERE. Be The Change Grady High School! 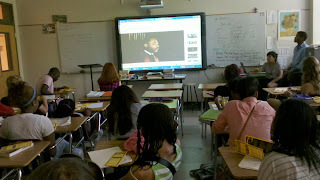 Today was the last day of school for Atlanta public schools and we were given a monumental challenge. 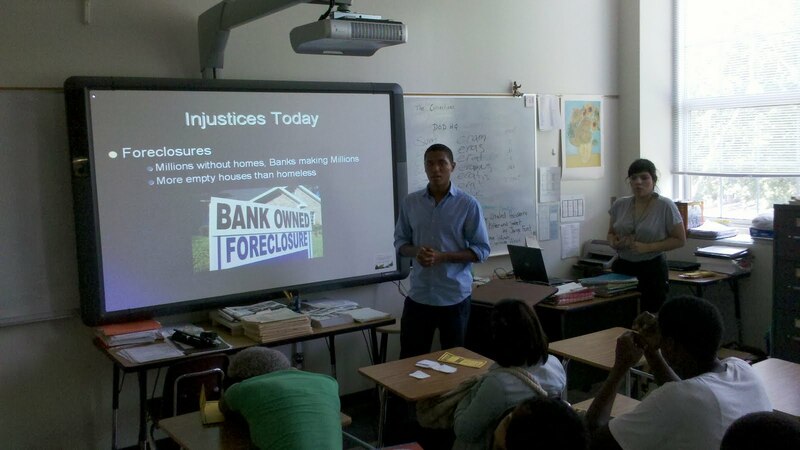 Saji, Josie, and I were given the opportunity to do our, "Be The Change" presentation to four different classes. Normally this would be no problem but given that fact that we would be competing with the pure excitement that come with the last day of school, well, we've all been there. 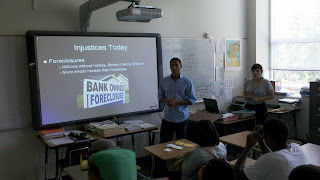 The "Be The Change" presentation is something we put together specifically for classroom presentations. 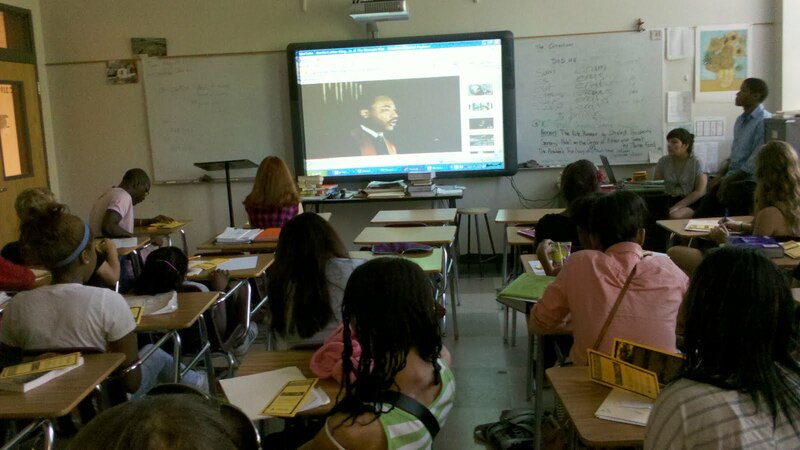 The presentation's focus is Dr. King's message and work in the last year of his life. The presentation also focuses on the modern relevancy of radical work in the late sixties. In what ways do the giant triplets of evil(poverty, racism, and militarism), as King called them, control our minds, bodies, and communities? How do these systems of violence and oppression interact and support each other? Pretty serious questions for the last day of school right? Lastly, after talking about local changes students would like to see in their communities, we gave a pitch for this years "Be The Change" youth convergence which is being held in Atlanta July 29-31. We were all surprised at how interested all the students were, the Grady crowds were all totally interested and many of them registered on the spot! We even were asked for a photo OP with the 9th grade class president. So we're just that much more excited about this years "Be The Change" youth convergence! Keep in mind that we are totally available to do the presentation, which is about 45 minutes, over the next few months. It's appropriate form high school and college aged folks and can be tweaked for specific audiences. Dell was hired as an intern with the Georgia Peace & Justice Coalition back in February. 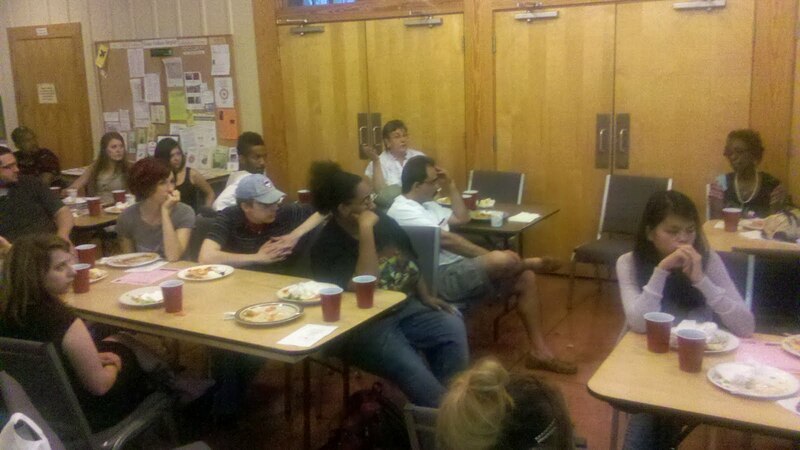 Since then she's been and invaluable with statewide organizing efforts. Sadly the funding for Dell's internship runs out in early June. We would really like to keep her on until August 15th as her role is this year's "Be The Change" youth convergence has proven vital, but in order to do that we need an additional one thousand dollars. Can you help us make that happen? Any and every amount makes a difference. American Friends Service Committee Attn: Tim Franzen P.O. Box 2747, Atlanta, Ga, 30301. Your contributions make our work possible! Be The Change Cross Keys High School! Today marked our last visit to Cross Keys High School this year, as they prepare for summer break. Cross Keys has always had a very special place in my heart as it was the first school to welcome Student Career Alternatives Program with arms wide open. We've been working with Cross Keys for three years now! I've literally watched these students grow up. Today we focused on promoting our third annual "Be The Change" Youth Convergence, and we were excited to be joined by several students who helped us hype the convergence to their friends. This year's convergence seems more important, more crucial than years past. There are so many issues effecting youth in Georgia right now that talking up the convergence has become an easy task. All we have to do is mention immigration or education budget cuts and everyone is paying attention, asking how they can get involved. High school students are aware of the injustices that go down every day in our communities, in fact I'd say most students at Cross Keys are down to resist the systems of violence and oppression that control our minds, bodies, and communities. It's often difficult to find a space where youth are given the space to imagine the community they want to live in, the tools to create the community they want, and the freedom to build there own movements. We hope that this year's convergence can start a lot of those conversations. Nakba Day is an annual day of commemoration for the Palestinian People of the displacement that accompanied the creation of Israel in 1948. During the 1948 war an estimated 700,000 Palestinian's were expelled or fled their land and hundreds of Palestinian villages were depopulated and destroyed. The overwhelming majority of Palestinian refugees, both those outside the 1949 armistice lines at the war's conclusion and those internally displaced, were barred by the newly declared state of Israel from returning to their homes or reclaiming their property. They number several million people today, divided between Jordan, Lebanon, Syria, the West Bank, and the Gaza Strip, with another at least quarter of million internally displaced Palestinians in Israel. 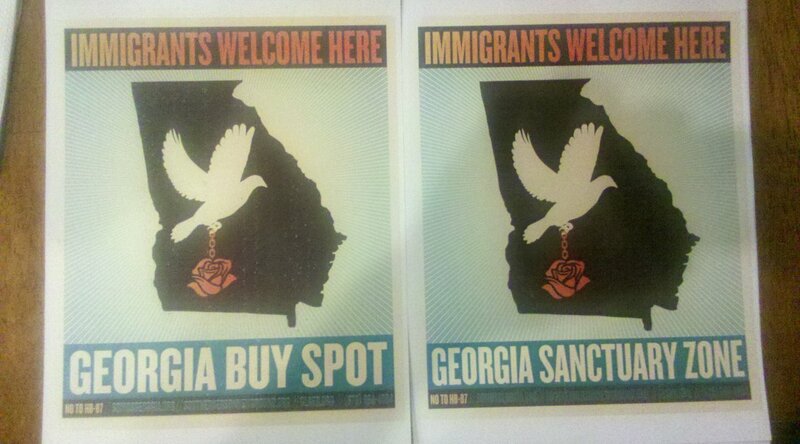 It should be noted that descendants of refugees live all over the world, with Atlanta being no exception. The Loss of Palestine and the dispossession and dispersal of the Palestinian people is known to them as al-Nakba, meaning "the catastrophe," or "the disaster." The Nakba day is one recognized globally, marked by commemorations and resistance actions. 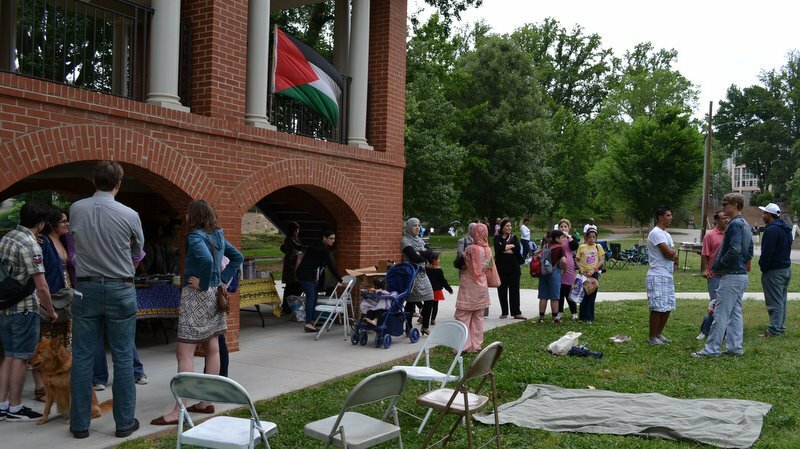 Locally the Movement to End Israeli Apartheid Georgia(MEIAG) held it's third annual Nakba commemoration at Piedmont park. It was a day not only set aside to share stories of family history, but also a day to build community and to enjoy each others company. This years event was by far the largest to date. 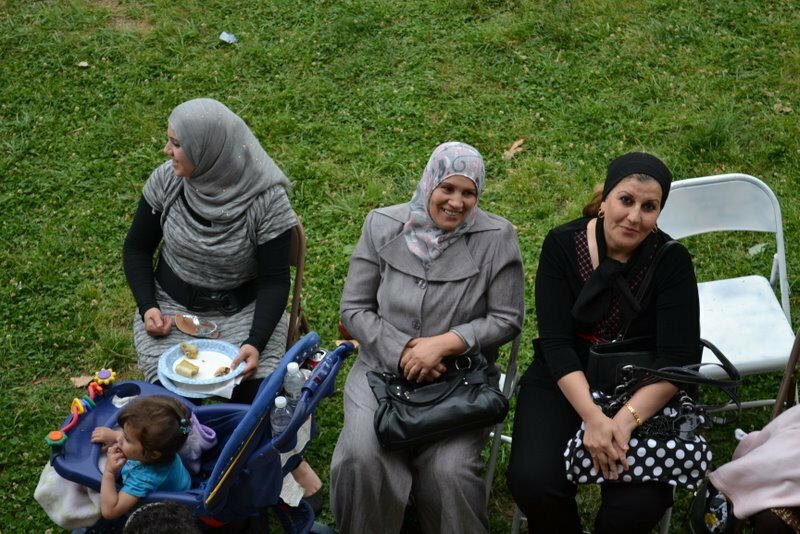 Over the past year MEIAG has been working with Palestinian refugees in Clarkston , work that AFSC strongly supports whenever we can. 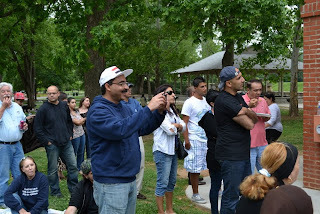 Several families fromt the refugee community came out to the park to share their stories, meet new friends, share delicious food, and play games in the park. Today we hold up Palestinian communities all over the world as we hope for peace and work for justice in the region. To learn more about AFSC's operation's in Palestine Click HERE. 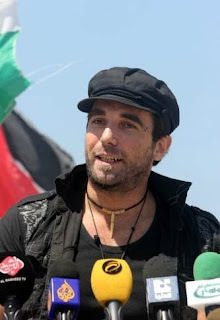 AFSC staff of the Palestine Youth Program in Gaza have sent the following message to express their grief at the abduction and killing in Gaza on 14 April 2011 of Vittorio Arrigoni, an Italian citizen and member of the International Solidarity Movement. The people of Gaza are saddened and shocked by the killing of a man who came from far away, leaving his mother, family and friends in order to be here and to share everything - love and suffering, songs and laughter – with the people of Gaza. He didn’t live long enough for us to tell him thank you. He didn’t live to see his family again. People in Gaza knew Vittorio very well. He used to move freely around Gaza. He lived as a Palestinian. He ate our food, visited our homes, played with our children. I didn’t meet him, but I have heard his story from people who did. I see other people that have faces like him [foreigners]. They are here. 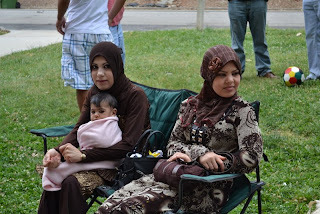 They are here to say that we are all human and to share their love with people here. How Do We Make Sure HB87 Fails? Today Governor Deal signed HB87 and effectively ushered in a new era in Georgia history. We now live in what some are calling the Juan Crow era, an era that we all must work to ensure is brief. As news of HB87's signing spread folks started heading to capitol to express their outrage at Governor Deal's seemingly inevitable action. Knowing the Governor was politically committed to signing the bill did not soften the emotional impact. To be frank, today has been a very tough day for countless people. Folks also came out to a town hall meeting held at Trinity United Methodist Church to discuss the impact of HB87. Groups shared resistance actions that they have been organizing and further strategized on effective next steps we all can take in the effort to make sure HB87 fails. Throughout the course of the town hall meeting it became apparent that HB87 will be defeated. There were just too many committed folks in the room, too many communities represented, too many dynamic ideas put out and too many organizations lining up to support resistance to this bill. It's clearly a question of when and how, not if. A boycott of Georgia. Already calls have gone out to avoid traveling to our state of hate. It is urged to no longer plan vacations to Georgia, have your conferences booked elsewhere, skip Georgia if you're booking a music/cultural tour, and make it known why you are boycotting our state. 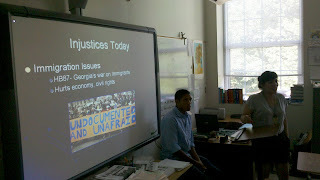 Georgia Undocumented Youth Alliance is working on creating space for youth in the movement to defeat HB87. 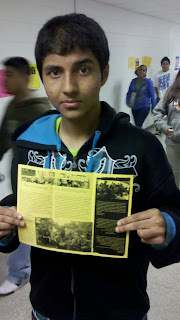 Here at AFSC we also hope to raise the voices of migrant youth through our Migrant Youth Voice project. 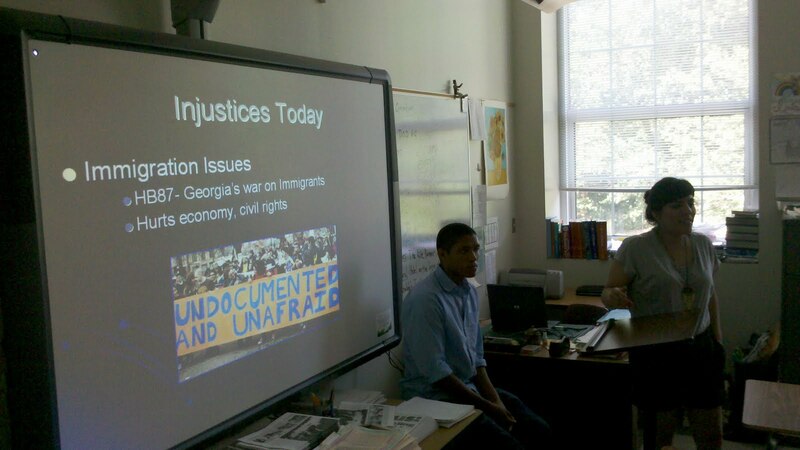 We hope to launch a new website in the next month where we will be publishing a series of short films documenting the lives and struggles of undocumented youth in georgia, in edition we'll also be hosting a number of film screening across the state in the fall. 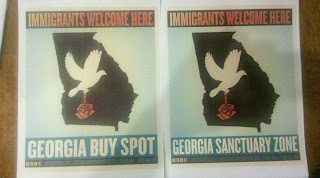 Southerners On New Ground and the Georgia Latino Alliance on Human Rights (GLAHR) will be leading an effort to organize businesses and sanctuaries to become hate free zones. Houses of worship and places of business that commit to non compliance of HB87 will be certified "hate free" zones where immigrants and human rights supporters are welcome to shop or worship. 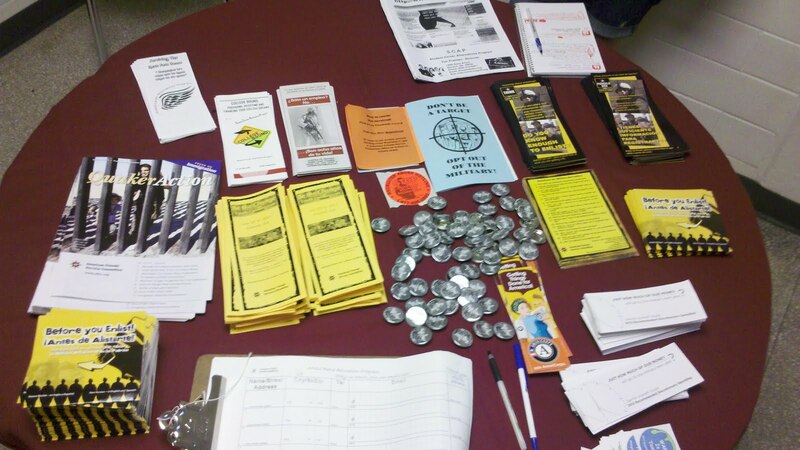 Contact Southerners on New Ground or the Georgia Latino Alliance on Human Rights if you're down to help with this ambitious effort. We all shop, and many of us are active in a church, so that's where we can start! 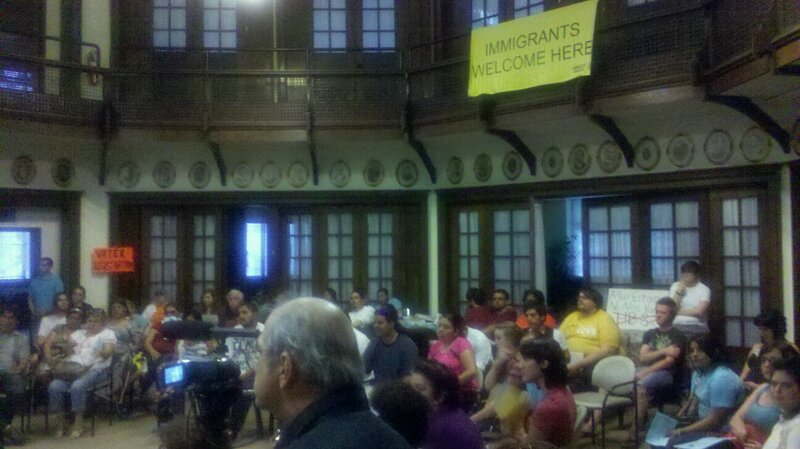 GLAHR has also organized an action for women in the defense of immigrant families. Women from all over Georgia will come together to demand a stop to the separation and persecution of their families and to put a stop to 287g and HB87. Wearing white, with their children by their side, women and those in solidarity opposing this legislation will gather at Centennial Park on May 22, 2011 at 10am. Finally I just want to say that in my personal experience, sometimes failure can be the foundation by which success is built upon. I mention that just to highlight the opportunity that has been presented by HB87's signing today. The chance to build and strengthen communities, the thousands of people that will experience a life changing political awakening as a result of Governor Deals pen stroke today is inconceivable. It is on the foundation of HB87's failure that we can build something new, something different. Atlanta Rallies For the Arts! 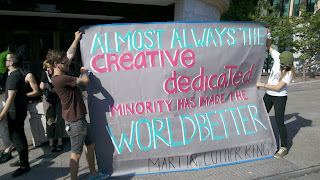 Today various art organization’s Including WonderRoot Community Art Center, Atlanta Contemporary Arts Center, Living Walls, Spellman Museum, and Dashboard Co-op pulled together a last minute demonstration outside of the regularly scheduled city council meeting. The reason for the gathering? Mayor Kasim Reed has purposed that the council approval a 2012 budget that would reduce its funding for arts based grants to$250,000. To put those digits into perspective Nashville granted $1.8 million directly to arts and culture organizations. The City of Charlotte granted more than $3 million. Both cities are of course smaller than Atlanta. 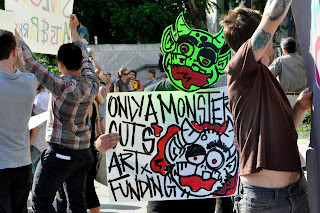 It’s an established fact that every dollar investing into the arts in Atlanta produces jobs and profit hand over fist. It’s a curious move for Mayor Reed considering the lip service he’s given to the arts in the past. 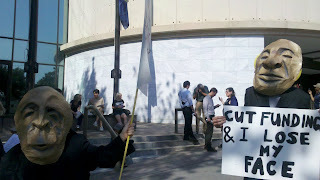 -Mayor Reed’s 2010 Cultural Platform. Today over a hundred people came out of the woodwork to demand that city council reject Mayor Reed budget slashing proposal. It never ceases to trouble me that our Government has no problem finding an abundance of capitol when it comes time to building a new jail or prison to house non-violent drug offenders. It just seems to endlessly rain billions of dollars when Wall Street needs a handout, and the cash flows event harder for seemingly endless war in the Middle East. What’s the price of recklessly holding up death, oppression, and people who are already rife with overabundance? It forces our budgets to de-prioritize human need, programs of real social uplift. We are living in our countries’ greatest crisis of economic priority in my lifetime. 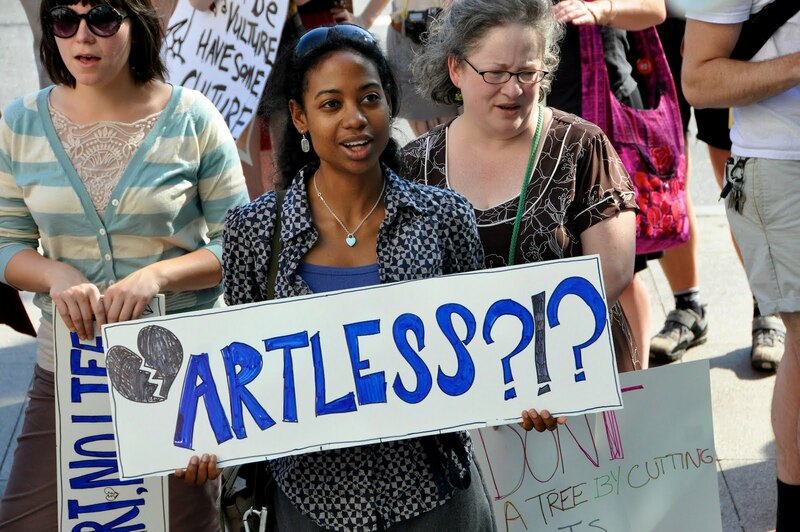 Never has the public sector been forced to endure the dramatic budget cuts it now faces on every front, and it seems funding for the arts in Atlanta is no exception. I can’t think of a more crucial time for folks to have their political awakening and hit the streets, pick up the phone, and make some noise. We are clearly far beyond the point at which we can expect elected officials to do the right thing and lead us to the world we want to live in. It seems that we must provide that leadership, and they’ll have no choice but to follow. Call/ Email City Council and demand they support funding for the arts, not cuts! This video was put together by a group of students at the Horizons school who were a part of our "Be The Change" curriculum. During the course of the curriculum these students banded together to form a group called, "Pushing Forward". They meet regularly not only to enjoy each others company and skateboard, but also to explore ways to promote skateboarding as a healthy lifestyle. For Pushing Forward skating is a great way to stay in shape, and stay out of trouble. One of their goals is to chip away at the reputation skaters have in Atlanta. They believe that skateboarders should have the same rights and street cred that bicyclist have. A former senior CIA analyst and intelligence briefer for Presidents Reagan and H.W. 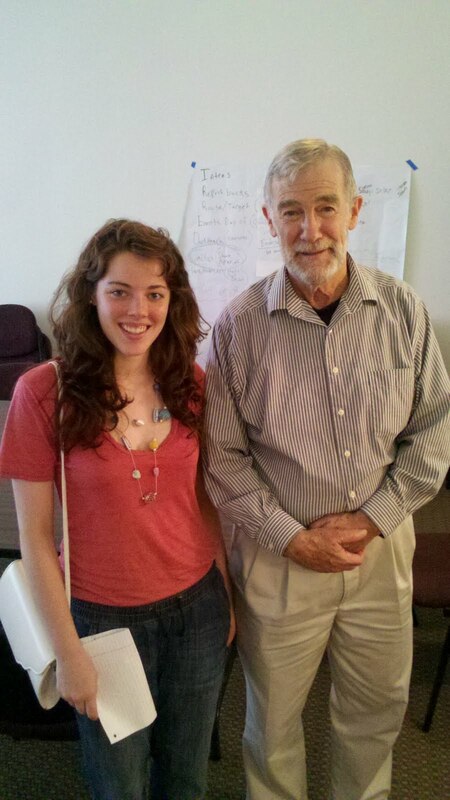 Bush turned political activist, Ray McGovern has used his ethos in politics and his experience with war to validate his outspoken opinions against the war in Afghanistan. McGovern graduated from Fordham University where he majored in Russian and proceeded to obtain a position in the CIA, where he worked as an intelligence briefer and analyst for 27 years. Since his retirement from the CIA, McGovern has repeatedly protested US involvement in both the war in Iraq during the W. Bush administration and the war in Afghanistan during the Obama administration. McGovern has challenged the sincerity of several authorities including former Secretary of Defense Donald Rumsfeld when he quoted Rumsfeld as saying that he knew where the Weapons of Mass Destruction were after it had been confirmed that none existed. In addition, he was arrested for disorderly conduct when he stood silently in protest during a speech made by Secretary of State Hillary Clinton. McGovern’s strong thoughts against the wars are influenced by his experiences with the War in Vietnam and the Cold War. McGovern also cofounded the Veteran Intelligence Professionals for Sanity, an organization of retired US intelligence workers who have criticized government policies and issued memorandums criticizing the policies of former President George W. Bush and former Secretary of State Colin Powell. Additionally, he coined the acronym O.I.L. (oil, Israel, logistics). McGovern has encouraged opposition to the war in Afghanistan, expressing the need for taking action against it. 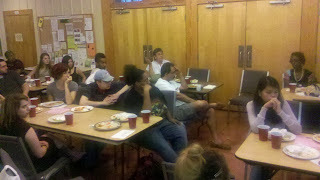 AFSC/SCAP Featured in Documentary Film!! 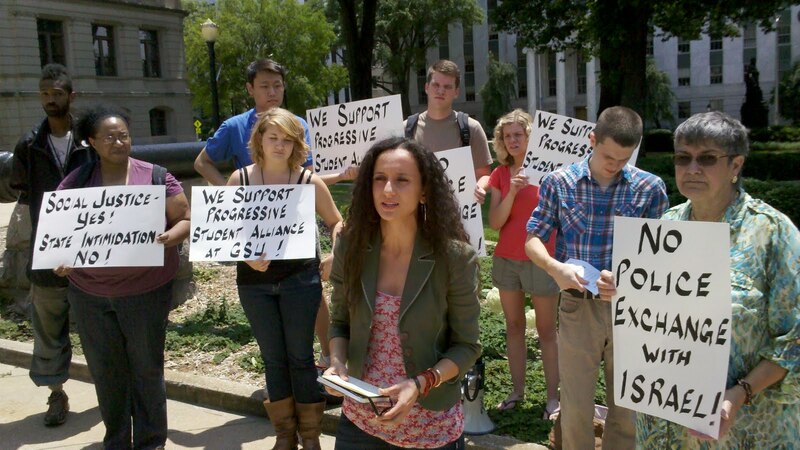 Students Demand, "Don't Defund Our Future"